As Barefoot Contessa Ina Garten and The Great British Baking Show's Mary Berry teach us inner peace, scores of filmmakers are joining the frey to heal the world by capturing food onscreen. 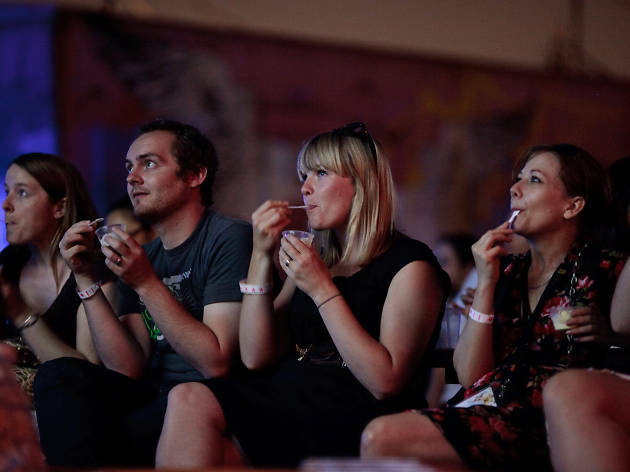 Starting today, NYC will celebrate culinary cinema at The Food Film Festival, a four-day bash at which you can eat the food you're watching live. Held at the AMC Empire 25 near Times Square, this year's fest features viewings of James Beard: America's First Foodie, with provided helpings of burger and onion sandwiches (tonight); Hometown Heroes: Chopped Cheese & More (Friday); a screening of 1985's Tampopo with ramen and burlesque performances (Saturday); and a host of short films centered around brunch for Sunday's big meal. Themes! Some events are sold out, but the remaining ones go for $45–$65. You can learn more and buy tickets here.